As some of you may already know I am a flight attendant and one of the things I love most about my job is that I get to play dress ups everyday with my uniform. 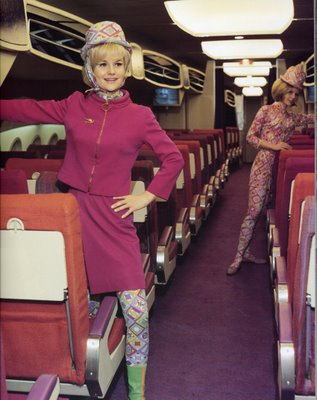 So I have been looking back at the wardrobes of these inflight fashionistas over the decades and all I can say is thank goodness I wasn't flying in the 60's! Never underestimate a gogo boot inflight. 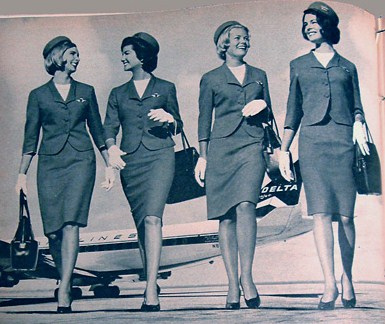 Most photographs of flight attendants are taken on the wing of the aircraft. I personally have never stood on the wing for any reason whatsoever. And of course the super stylish french still do over at Air France. From the good, the bad and the downright ugly I think we all love looking at what the hostie is wearing inflight. I like to think of it as a winged catwalk at 40.000ft! Have a great day and enjoy your flight. Tania, Melbourne Australia. Last of the romantics. Join me as I stumble across life's little happenings. Images I have taken myself are not to be used without permission. Merci. Simple theme. Powered by Blogger.